They will enable you to cook your heart out and feel enlightened all at once. Many of us take books about food and cooking to bed and read them as novels. I like it better when they read as history and connect us to identity and culture: More substance, less fluff. 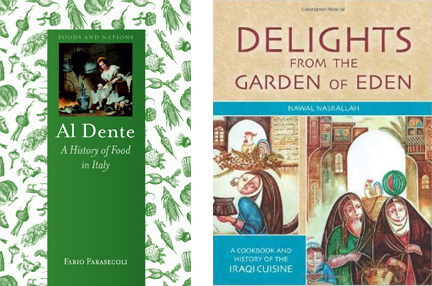 Two such scholarly tomes are Al Dente: A History of Food in Italy by Fabio Parasecoli (Reaktion Books, 2014), and Delights from the Garden of Eden, A cookbook and history of the Iraqi Cuisine by Nawal Nasrallah (Equinox Publishing, 2014). Both are dense with passion and expertise, written exquisitely with the perspective of exhaustingly detailed research. But don't get me wrong, they are infinitely enjoyable and perusable. They will enable you to cook your heart out and feel enlightened all at once. Not since Waverly Root's definitive book, The Food of Italy, written in 1971, has another book, also destined for "classic" status, taken root. More than four decades later, as Italian cuisine has proven to be one of the most relevant, if not prevalent, cuisines in the world, Parasecoli, a native of Rome (his grandparents lived in the village of Tossicia in Abruzzo) explores the myths and realities of Italy's gastronomic narrative. Most fascinating to me is the concept of campanilismo, which the author describes as a crucial aspect of Italian food culture: "an expression that refers to the love, pride and attachment that the inhabitants of a certain place - those who find themselves under the shadow of the town bell tower - feel for it." There is a wonderful map (page 269) that strikingly illustrates the twenty contemporary regions of Italy better than anything could. We learn that the regional demarcations of Italy are more recent than one would realize, but serve to inform our sense of the customs and characteristics of each parcel of culinary identity - encompassing local wine, food, ingredients, and ancestral predilections. In addition to his welcoming transmittal of history, you can feel Parasecoli's pride for his own family's table. While the last chapter of Al Dente is about the globalization of Italian food, I believe the previous chapter, "Now and the Future," is particularly worthy. Included in his astute prognostications are two very nice recipes, one for Pennette with Salmon and Vodka and the other for Tortellini alla Boscaiola, cooked, of course, al dente. Equally riveting, and a kilo or two heavier, is Nawal Nasrallah's book Delights from the Garden of Eden, which is subtitled "a cookbook and history of the Iraqi cuisine." The article "the" in front of history in the phrase caught my attention: Is it the author's regard for Iraqi cooking as a semaphore of its historical importance and its exalted (maybe rightful) place in the story of the world's cuisines? Since I have little knowledge of the food of Iraq or the stories within, I was fascinated by this idea. Time to explore! A professor of English and Comparative Literature, the author beckons the reader to "anticipate more than a taste of Iraqi food, expect a cultural immersion experience which will cater to your culinary senses and intellect alike." Straight from the start then she commits to expressing two kinds of hunger: both sensual and intellectual, and it shows. Many scholars place the Biblical "Eden" in a massive oasis in southern Iraq. The book, its illustrations, photographs and design, is generous and thoughtful and guides your historical journey through Ms. Nasrallah's personal lens - Eden itself as a metaphor of pleasure and poetry. Chapter titles delight: "Ancient Wives in Ancient Kitchens"; "Grocery Shopping in Medieval Baghdad"; "Bonding with Kubba"; there are 40 pages on bread. I will immediately begin cooking from "Stews" (chapter seven); follow with "Stuffed Foods" (chapter 11), and will make Kufta Maqliyya (Iraqi fried meat patties) tonight for dinner. Start with the glossary for a quick whiff of what's in store and let your journey begin. Rozanne Gold is a four-time James Beard award-winning chef and author of Eat Fresh Food: Awesome Recipes for Teen Chefs, Healthy 1-2-3, and Radically Simple: Brilliant Flavors with Breathtaking Ease. Rozanne can be found on Facebook at http://www.facebook.com/rozannegold.